Over 7,000 hectares of coastal mangroves have died along 1000 km of coastline in the Gulf of Carpentaria. James Cook University’s Dr Norman Duke said the dieback was unprecedented, and followed a prolonged period of high temperatures and unseasonally dry conditions in the region. Dr Duke, a world expert on mangroves, said the dieback was severe and widespread, affecting 9% of mangrove vegetation from just south of the Roper River in the Northern Territory to near Karumba in Queensland. “In the southern Gulf, some shoreline areas were observed to have lost complete seaward fringing mangroves stands of 100-300 metres wide. In most places, however, the most notable pattern had surviving narrow fringes with large areas of dieback behind surrounding upper intertidal saltpan and saltmarsh areas. “There were also zones between living and defoliated areas that displayed intermediate symptoms with partial defoliation and yellowing. “With no previous reports of such extensive, unexplained dieback of mangroves anywhere in the world, these observations suggest the extent, severity and timing of this occurrence of mangrove dieback is unprecedented,” Dr Duke said. Mangroves are vital for healthy waterways. They filter nutrients, pollutants and sediments from the land and they provide homes for 80% of seafood species. The total value of fisheries in the Gulf of Carpentaria is at least $30 Million per annum. Mangroves are also great at storing carbon. In fact, the mangroves in Queensland’s Gulf coastline store 320 mega tonnes of CO2. That’s more than half of Australia’s entire annual CO2 emissions. When mangroves die the carbon is released back into the air. Increased CO2 emissions are the key contributor to global warming. 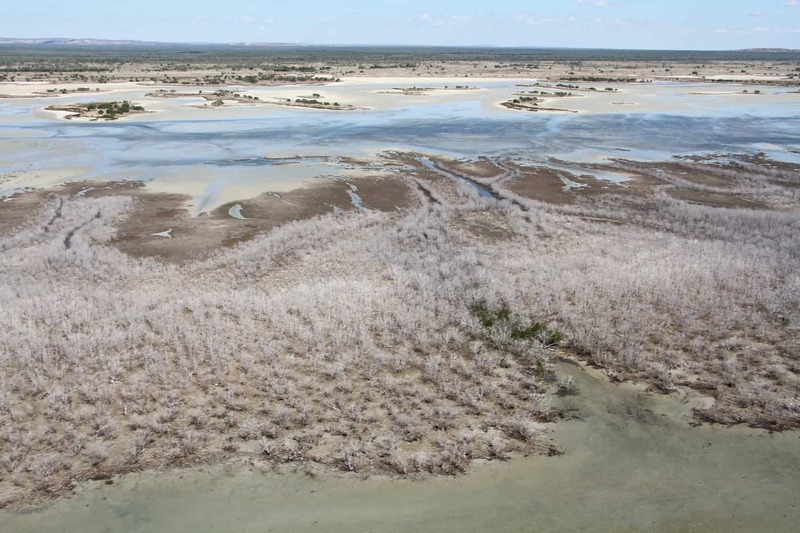 To assess the damage to the Gulf mangroves, I recently flew by helicopter over 700km of coastline, where there had been reports of widespread mangrove die-offs. I was shocked by what I saw. This is the worst mangrove mass die-off I have seen anywhere in the world. There have seen smaller instances of this kind of moisture stress before, but what is so unusual now is its extent, and that it occurred across the whole southern gulf in a single month towards the end of last year. Mangrove forests played an essential role in the region’s ecosystem and are the nurseries for many fish species. Think of them as kidneys – as water filters and purifiers. As water from rivers and floodplains run into the ocean, mangroves filter a lot of sediment, and protect coral reefs and seagrass meadows. That service will be lost in the areas affected by die-off. There are already anecdotal reports of marine life dying and piles of dead seagrass washing up on the shore. If that’s true, then turtles and dugongs will be starving in a few months. And it will get worse over the coming years as the roots of the dead plants rot. The problem is that the mangrove growth rate isn’t high enough to stabilise the environment. In five or six years’ time, the roots will break down and those sediments will become destabilised. And that will threaten the near-shore habitats of seagrass and coral. Some zones have been completely removed of vegetation across the tidal profile and no amount of seedling growth will stop ongoing erosion. Mangroves also protect the shoreline and coastal ecosystems from storms and tsunamis. Absorbing waves that hit the coast helps limit the impact of storms and rising sea levels. We need that resilience and protection of the shoreline so we can slow down the effects of sea level rise. Mangroves die off naturally on a small scale, but I’ve never seen anything of this magnitude. Around the world there had been widespread destruction of mangroves, but usually as a result of direct local impacts such as clearing for the creation of shrimp farms. But the areas in northern Australia are relatively pristine. The clear culprit in this case is climate change, which is warming waters and making rainfall more erratic. That puts the mangrove forests at their tolerance limit and when a strong El Niño hit the world at the end of last year – warming waters in northern Australia and drawing rainfall away – they were pushed past their tolerance thresholds. Mangroves are good at adapting, but not to such severe changes that occur so quickly. It is difficult to say how well they will recover over the coming years. Some areas could transition completely away from being mangrove-dominated, and become salt pans – flat, unvegetated regions covered in salt and other minerals. There has been very little monitoring of these relatively pristine mangroves in areas where very few people live. Such a program is urgently needed. We need to be able to form a rapid assessment response for these emergent situations. These habitats are retreating far more rapidly than any of the other endangered forest types we have. We need to equip people to carry out independent assessments of what the local impacts are. We need to be monitoring these events so we can properly understand what these larger effects are. Are we, for example, reducing the resilience of mangroves thus making them more vulnerable to the climate? The causes of the dieback were likely from an extended dry period, coinciding with an extended hot period. This started in October/November 2015, when the mangroves started to die back. It then took several months, until March/April this year, for local community members and scientists to be concerned about this. This was raised with Norm Duke at a conference in Darwin and then reached the media. This is an indication of the failing of government funding and resources to support scientific monitoring. While there are (or were) national and global remote monitoring systems, it was locals that rang the alarm bells without government funding. This shows the ability of local citizen science to raise globally important issues. Even now, most of the research has been done from the air or via remote sensing. We still have little on-ground information, nor do we know how the mangroves will recover. There needs to be someone on the ground to take measurements and collect data about the recovery which could be done by locals in the region. The dieback has several implications in relation to land use, fisheries, biodiversity, carbon and the understanding of climate change.